Java is an amazing computer programming language which is independent of any complex platform. It may be used for general purposes like creating a new application where computer programmers can run their codes from anywhere in any program that supports Java if they have written it once on it. Regardless of your computer type and version, the applications of Java can be run on any device with the help of Java virtual machine. Java is one of the most sought-after languages that you may be asked in your interviews if you are applying to some computer programming related job. Spring Boot is a stand-alone application based on a feature called Rapid Application Development (RAD). It is very easy to run and with the help of this program, you can make use of the various applications and web development skills which help you in creating a novel application using Java. It also provides help in figuring out its configurations. Kotlin is very similar to Java language in terms of its easiness to learn and use. The functionality of Kotlin is also operable on the Java Virtual Machine. The codes made by Kotlin are very easy to read, operate and understand. The compilation of Kotlin programs is done using the source codes of Java. Core Java basically focuses on the basics and letting you differentiate between Java and other programming languages like C and C++. Understanding the various concepts related to Core Java helps you in working with this language in an easy manner including use of all the features redefined in the newer versions of Java such as class improvements, interface changes, local variable type inference, and string concepts. 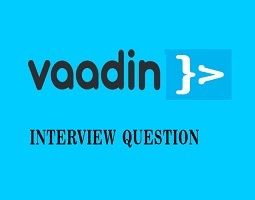 Vaadin is an open source online application program which also includes Java as one of the basic frameworks. It contains a complete set of all the components, tools and applications included for the Java users who need to implement the source codes which are made in Java language. It operates with the implementation of HTML5 based user interface. Scala is a programming language which is general purpose. Its key components, variables, traits, and functionalities are designed to support the function-based programming systems. It tells you about the complete specifications and use of each programming feature and where and when to use them. Various different types of objects and classes are used in this language. Maven is a type of automated tool designed for understanding how software is built using a programming language and how it is dependent on the various codes and functionalities of the basic language. Its basic concepts and components tell you about all the key steps which are involved in the process of web-based application development using these tools and how to manage them. Java Play involves details of both Java and Scala-based programming sources and codes. It lets you through the various frameworks in which Java works and the different types of interfaces used in the framework. It involves all the concepts related to frameworks and interfaces used in these programming languages. Groovy is a programming language which is one of the most compatible with Java platform. It lets you combine all the Java related modules and helps you in integrating with the system of your framework. With the help of this, you can learn to extend the Java program application and use it to provide reusable codes. Servlet deals with a very important part related to the Java language and its online applications. It receives, processes and responds to the requests which come upon the web server. It is also employed to increase the capability of web-based servers and their application, developed using Java, with respect to the programming languages and how to use it over other programming languages. Hibernate is one of the most important tools to understand Java programming which is based on the Object Relational Mapping. You can get all the concepts related to the framework of this tool and how it is used to configure the codes and couple them. Java Grails involves the basics concepts of scaffoldings, closures, and meta-programming. It is based on the basic easy and simple steps to develop an application using certain frameworks which provide high productivity by use of conventional coding. It is very similar to the Apache Groovy based programming. EJB is basically an abbreviation for Enterprise Java Bean. It is a Java-based tool which lets you create the web-based applications in a secure and robust manner. With the help of this tool, you can even manage the life cycle of an application, make it secure and adjust its transaction management. Apache Ant is a tool which involves various steps by which you can automate the process of making programming software. It is a highly useful tool in Java where you get a complete library and command tools to do the operations for you. It lets you operate all the basic operations of process automation in programming. Struts2 is one of the most famous and robust frameworks which you can use in Java to develop online web-based applications. It uses the advanced concept of model view controller (MVC) architecture to develop web-based applications and make them more structured and useful for various kinds of purposes. Java 10 is an advanced version of the basic Java programming language. It contains many new and amazing features as compared previous versions such as Java 7 or Java 8, such as local variable type inference, consolidated JDK Forest, thread local handshakes, parallel full GC, garbage controller interface and many more. It also provides you with newer expressions, annotations, and relations of Java language. Java inheritance is a methodology in oops which deals with the familiarization of the object-oriented programming concepts of Java. It forms one of the most integral parts of this programming language in which one object can get the inherited features as well as the data contained in the other classes of the program. Java String is an important part of learning the whole concept of Java language since strings form one of the most important classes of this programming language. With the help of this tool, you can create a string object in many different ways which can then be used in the programming of the web-based applications. The Apache Kafka is one of the tools which are coded in Scala language and is openly operable in Java and offers specific broker-based, consumer-based, producer-based and topic-based features. It was developed for providing a uniform and high performing platform for managing large amounts of data. Java Collection deals with the collections framework. With the help of this tool, you can use the combination of various interfaces and classes available in Java and use them to store or manipulate the data the way you want. You can also store them in the form of any object using this tool. JMS stands for Java Message Service and is an amazing tool which provides a better way to connect with the client and have a proper route of professional communication. With the help of this tool, you can get to use both type of messaging services, which are synchronous and asynchronous and also the various types of messaging models. Active MQ is an effective communication guide system which dealing with two different types of distributions generally encountered in the web-based applications. This tool is fully based on Java. You can also synchronize this tool with the other messaging services provided by Java and work on them simultaneously for better communication. Spring Batch Interview Questions: Being an opensource technology Spring Batch framework provides a set of reusable functions that are essential in processing large volumes of records. It is built on the POJO-based development approach of the Spring Framework. Apache Camel is a routing and mediation system between the various types of systems and patterns that exist in an enterprise. Apache Camel helps in implementing Java-based programs in an effective and configurative manner in all types of system. It is a message-based communication-oriented system which applies enterprise integration patterns. JBoss Fuse is based on the concepts of open source gateway initiative (OSGi) which is a type of the Java framework specially designed for making dynamic components in the application system. It enables to collect various components of a program to be collectively bundled together for better modulation of software. Gradle is a combination of the Apache Ant and Maven tools and used for providing animation in the programs or software developed using Java. Its configuration is based on Groove based system rather than the usual XML type of format. With the help of Gradle, you can easily make a build tree for multiple projects. JBPM stands for business process management. This tool takes into account the two different scenarios of management as well as engineering to ensure good performance of the organization in the business field. It also helps you explain the diagrams and model of business execution. Drools is a tool which deals with the functionality and scope of the business management involved in making systematic progress in any system or organization. It involves the use of various KIE tools such as opt Planner and other technologies which help in better business management. ESB stands for Enterprise Service Bus. It is a specially designed tool which aims at the implementation of the principles laid down in the service-oriented architecture. With the help of this tool, one can integrate various applications by means of a bus which communications between each of them. JSF stands for Java Server Faces technology which is based on the model view controller (MVC) pattern. It is designed to collectively segregate the information of a presentation and creates a user interface where the various components of the system can be easily used between the user interface and business prospect. JSP stands for Java Server Pages. It is a tool which makes use of HTML and XML based technologies, which are also being used by Java, to create web pages that are dynamic in nature. With the help of this tool, the user is able to add dynamic elements to make the web pages more attractive and interactive. JUnit is a testing interface in Java developed for building test-based online programs. It lets you get through all the types of testing including manual testing, automated testing, unit testing and various other features of this tool. Spring is one of the frameworks used in Java for making applications. With the help of the spring framework, the users of Java are able to develop the enterprise application in a much simpler and easier manner in collaboration with the support of several other frameworks such as Hibernate and Struts. Struts is another type of frameworks developed by utilizing the concepts of the Model View Controller (MVC) Pattern. With the help of the implementation of this concept provided by Struts, the users of Java can separate the various concerns of the application system and implementing a simple code for its interpretation.